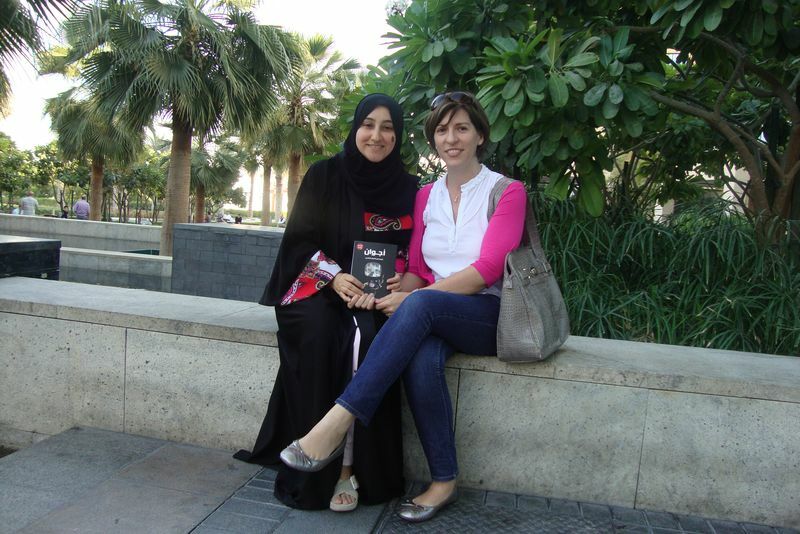 Noura al Noman is a science fiction writer from the United Arab Emirates, author of new novel Ajwan. Here, we are delighted to publish the English-language version of an interview with her, conducted by Cristina Jurado, and published by permission of the Sense of Wonder blog. Cristina Jurado: Ajwan is an Arabic sci-fi novel for young adults. I would love to hear from you a small synopsis for our readers. Noura al Noman: Ajwan is a real female name in Arabic – it is derived from the word “jown” which means a small sea or cove, Ajwan is the plural of it. She is a 19-year-old girl who is from a water-breathing race. The novel opens with total emotional devastation describing how she narrowly escapes being killed by a natural disaster, which destroys her planet, and annihilates her race. The traumatic experience awakens a latent ability in her -Empathy. She is further traumatized by the news that she is carrying a child – her husband had died in the disaster. How is she to go on with her life as a refugee in this vast universe? Meanwhile, violent acts taking place around the sector of the universe leave investigators stumped. Soon these mysterious events impact Ajwan’s life further traumatizing her. In order to take back her life, Ajwan is faced with a tough choice – to abandon the path of non-violence and to become a soldier; but can she do it when she is also an Empath? CJ: I’ve read that you started to write Ajwan because you could not find an Arabic young adult novel for your daughter. How did you come up with the plot? How long did it take you to finish it? NN: Yes, I have two adult sons and four teenage daughters, and they all grew up around my library that is filled with sci-fi and fantasy novels which I’d collected since the mid 80s – of course all in English. Around four years ago I looked for Arabic teen literature and found next to nothing specifically written for teens, and whatever was available could never compete with what I had in my library. My husband and my close friends urged me to write in Arabic. Since I’d always loved the TV series Man from Atlantis, I chose for the protagonist to be a water breather. In the beginning, I only knew that she will have empathy as her special power (I think there isn’t enough empathy in this world, and there are too many destructive super powers out there), and what it is that will cause her to cross paths with the antagonist. The rest came as I began to write paragraph after paragraph. I was inspired by issues from my part of the world: disenfranchised and marginalized people, and how unscrupulous power hungry individuals may use such groups to further their own agenda through terrorism and violent acts. In order for me to actually finish such a project, while keeping a job and having a large family and commitments, I promised myself to write 800 words per day. I finished the manuscript in nine months resulting in 91,000+ words. CJ: I believe that your novel is very courageous. First, you tackle a genre that has very little tradition in Arabic. Second, you choose a girl as a main character. Third, the story contains references to social and political issues. Was it difficult to find a publisher to back up your project? NN: I tend to be an anomaly in a lot of the things that I do. As a teenager, I used to read English novels when I knew no one around me in my parent´s families or my school who did that. I used to wear jeans and t- shirt in the late 70s, early 80s when it was completely unheard of. In the mid 90s I was the only Emirati female to open a legal translation office of her own. I simply do not do things to please other people. The first Emirati publisher to read Ajwan (they had already published my first two picture books) said that they didn’t feel it is appropriate for under 18s. Two Arab publishers said they didn’t publish sci-fi, and the rest simply ignored my emails. One Emirati publisher read 3 pages from the middle and urged me to give it to him. I respected his work; but I was worried about his distribution (a problem most Arab publishers had) and also I have seen some of their work and the editing left a lot to be desired. You can say, I stuck it out till I got the right offer. I’d known that Nahdet Misr had translated The Lord of the Rings and Harry Potter, so I personally approached the chairwoman while she was in the Sharjah International Book Fair and she was very positive. Being picked up by Nahdet Misr finally showed me that I was not just a “geek” who thought she could write. CJ: With a background in English and Translation, do you have any plans to translate Ajwan into English? NN: Actually, almost as soon as I had finished writing it, a close friend who had been very supportive of my writing but who doesn’t speak Arabic asked me if she could read it. It took me a leisurely seven months to translate it. Of course, it remained just a translation, and needed proper editing – not by the translator. A month ago the editor sent it back all edited very nicely. Thankfully just in time for me to send it to the German publisher and the Turkish publisher who had contacted me after the launch to ask about Ajwan. And while all my friends are urging me to publish it in English, I cannot do so too soon. The problem we have in this part of the region is that our teens are reading English and almost no Arabic. The whole idea behind Ajwan was to provide Arabic content for teens. My 17-year-old daughter read it in Arabic and liked it. Three young ladies of close age tweeted to me saying it was the first Arabic novel they had ever read. This means that the subject matter (sci-fi) made Arabic seem more approachable to them. In short, I am going to wait a bit before I publish it in English. CJ: In an interview you mention the difficulties of writing sci-fi in Arabic as certain new ideas are hard to express. How complex was to write sci-fi in Arabic? NN: Writing Ajwan has been an education. Both in writing novels and in Arabic sentence and paragraph structure. I know it sounds funny; but it felt like I was writing in a second language – not my own mother tongue. I have a BA in English Lit and Masters in Translation. And I must admit I owe a lot to my professor, Basil Hatim for making me look at Arabic in a different way, and for helping me appreciate its nuances and guiding me to good reference books in the early 2000s. Even then, I had almost no frame of reference, because I was driven to write the story, and I had little time to refer to Arabic novels or Arabic structure. While tackling “scientific jargon” problems, I had bigger problems trying to figure out how to write “action” scenes. How do I describe a fight? In fact, how do I describe simple things which we do every day like “she clicked her tongue”, “he folded his arms as he leaned against the desk.” I had two writer friends (Salha Ghabish &Fatma Al Nahidh) both are accomplished Arabic writers, and neither one could help me. Quite frustrating! Thankfully, I live in a country, which subtitles all movies on the screen. So a viewer with little to no English background can still follow a sci-fi movie. This helped me in figuring out how “worm holes” and “ion/plasma drives” could be translated. I admit that they are not ideal (we really need our own jargon in Arabic); but at least I didn’t have to start from scratch. All in all, this has been an amazing experience for me, and I am thrilled to go through it over and over again, as I tackle new issues and push the boundaries of writing in sci-fi. In book 2, I have invented a word for an anti-gravity bike. I feel quite good about it. CJ: Are you an avid reader of sci-fi? Which are your favorite authors and why? NN: From 14 to around 28 years of age, I read almost nothing but science fiction and fantasy. Later I got interested in other genres and moved away from sci-fi; but continued to read fantasy. After I finished Ajwan, I decided to go back to reading sci-fi. My fascination with sci-fi started when I caught the trailer of Star Wars in 1977. It owned me completely. One of the first works, which introduced me to “world-creation” is Frank Herbert’s Dune. Up till then, the books I had read were obviously of adventures around galaxies etc. ; but when you see a complete world you are totally drawn into it and you even start to make your own little character, culture or adventure inside that world. Other authors were Alan Dean Foster with his Humanx universe.Anne McCaffrey with her Pern series. Julian May with her Saga of Pliocene Exile and the Galactic Milieu Series. Each and every one of these series taught me the virtues of creating a rich world with detailed backgrounds; they allowed for spin offs and sub plots at a later date. I wanted to do the same thing for Arab readers. However, I didn’t want to be bound by my own culture; if sci-fi is about the future, then I envision a future where Earth ethnicities have been so diluted that they are no longer recognizable. I think a lot of people will be upset by the lack of “Arab” culture in Ajwan. But I did that on purpose. 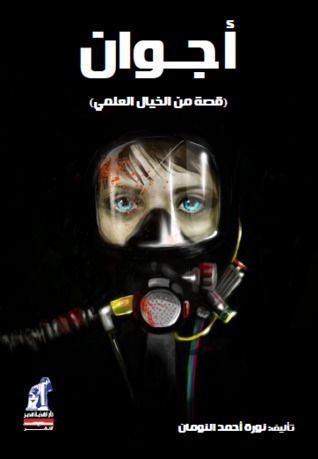 CJ: It was very surprising to learn that there are very limited sci-fi titles in Arabic. Why do you think is the case? NN: I am not sure really. I must admit that I have not read any Arabic novels in decades. The last full novel I read was Ahmed Khalid Tawfiq’s Utopia because I heard that it was a SF novel and I was curious to see how Arabs write SF. Even though I enjoyed it, I didn’t really learn much reading it. It was about Egypt in a few decades. I read “reviews” of other novellas by male and female Arab authors. It seems they all had the same “limit” – they were all earth-bound and were not too far into the future. I don’t know why really, and I cannot make an analysis of this as I am not specialized in this field; but there has to be a reason for it. Also they seem to always tackle “Arab issues”, political or social ones; which isn’t wrong per se (as Ajwan also does the same); but I think they can be a bit depressing as a read. Does SF have to be an instrument for “fixing” things? Can’t it be about creating worlds where there is the possibility for so much more? I have read a lot of SF in my youth, and if it wasn’t for its leaps of fancy, for the other-world-ness of its plots and issues, I would not have been attracted to it. I am worried that this is why our youth do not read (or write) SF in Arabic. I could be wrong. Another related element is the educational system, which has failed to make the youth interested in science as a study and as a career. Without science, there can be no science related writings and, of course, no readers either. And the tragic consequence of that is also the fact that the Arab world boasts little to zero scientific patents too. It is funny how people underestimate sci-fi, when it has the capacity to bring us back to the fore of scientific advancement. CJ: What do you think that sci-fi can bring to young Arab audiences? NN: Like I mentioned in the last answer, it can produce the Arab scientists of the future. It can also show them that some predictions of the future actually do happen and that they have to be prepared for that change in the future, whether it is good or bad change. But one of the best things which sci-fi taught me and I think it can teach others is that we have more in common with each other than we have differences. We have to celebrate the similarities and to respect the differences without trying to impose our ideals on others. By using aliens to introduce these ideas, we can send a subtle message, which can create a more tolerant generation, and hopefully a more peaceful future. But then I have been told I am too naive. CJ: In relation with the last question: what can Arab culture bring into sci-fi? NN: I think every culture has a unique attribute which when fused with sci-fi can produce content which will appeal to readers from other cultures that have perhaps been jaded by the same old stories from their own culture. CJ: There is s lot of Spanish influence in the names of the characters and scenarios of the story. You mentioned a story behind it. Our Spanish readers would love to hear it! NN: When you create a world, you have to have a premise for it. My premise was that humans in the future will have left Earth and colonized other habitable planets. This has taken them away from our own solar system and they have completely forgotten where they originated from. However, as is the nature of humans, they travel in ethnic groups. My world has Russians colonizing a few planets of their own. Chinese, Indians, Japanese and Spanish doing the same. On their planets, names of rivers, mountains, cities and even people originated from the language spoken by the first settlers. In Ajwan, Esplendore is a planet, which contains a slightly similar group of settlers. There are Spanish, Turks and Italians who have made up their own “countries/kingdoms”. When I decide I want the events to take place on a new planet, I decide which nationality settled the planet, then I come up with a concept (courage, beauty, violence, function etc.) and use Google translate to produce words, which I then use as names. Esplendore has several kingdoms, and one is a “Sultanate” named Segovia. The Sultana of Segovia is being manipulated by someone, so I chose the name “Marionetta” for her. Her son, who is heir, is called “Heredero”. Now, remember these names are transliterated in Arabic, so the Arab reader sees them simply as names without meaning (unless he speaks Spanish, then I am in trouble). I have done this to practically every name in the book. CJ: You are currently working in a sequel. Do you plan to make it a saga? NN: So far I have the plot for 3 more books. Book 2 will see the end of the quest, which Ajwan started in book 1. However, more and more things need to happen to her before she becomes the woman she deserves to be. This is all about character development. I also have the first chapter of a fantasy book for YA, which takes place in the UAE, and takes the heroes (a group of teens) on an adventure all around the seven emirates. Sadly, this will have to wait till I finish Ajwan 4, unless I go live on a desert island on my own and produce 5000 words per day. I can dream! It all started with a dream anyway. Cristina Jurado Marcos writes the sci-fi blog Más ficción que ciencia on Libros.com. Having a degree in Advertising and Public Relations by Universidad de Seville and a Masters in Rhetoric by Northwestern University (USA), she currently studies Philosophy for fun. She considers herself a globetrotter after living in Edinburgh, Chicago, Paris or Dubai. Her short stories have appeared in several sci-fi online magazines and anthologies. Her first novel From Orange to Blue was published in 2012.